Bartt's &quot;Pluck You&quot; album is fun and highly musical. 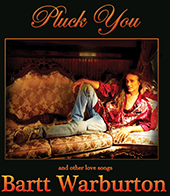 Bartt's "Pluck You" album holds ten songs of love, zombies and more love. Ukulele and more, including Greek bouzouki, vocal harmonies galore, and Bartt's famous flying fingers and inimitable sense of humor. AND a little artwork: front and back of the album.